We’re committed to engaging with stakeholders, municipalities, businesses, and motorists travelling along Highway 400 in the Toronto-Vaughan corridor. Throughout the planning, design and EA process, we will provide opportunities to share information about the works and hear your views. Consultation activities will be promoted in media and on this website. Join us at an upcoming Public Information Centre. In May 2018, Metrolinx and Infrastructure Ontario selected Mosaic Transit Group to design and build the Finch West LRT project. Mosaic Transit Group is conducting an Ontario Ministry of Transportation (MTO) Group ‘B’ Class Environmental Assessment (EA) study for Provincial Transportation Facilities to assess the traffic and environmental impacts of rehabilitating the Highway 400 Bridge at Finch Avenue West, which is being renewed to improve safety to motorists and the public during the operation of the Finch West LRT. 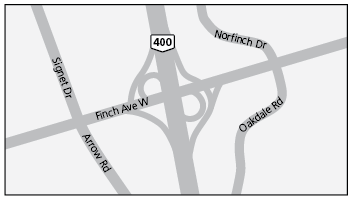 The planned rehabilitation activities for the bridge on Highway 400 at Finch Avenue West will be performed using a Rapid Bridge Replacement (RBR) approach. In a traditional bridge replacement method, construction staging would require long duration lane reductions and diversions, whereas with the RBR approach, traffic disruptions to motorists would be reduced from many years to weekend and night lane closures. The bridge rehabilitation works planned for Spring 2020 include replacement of the bridge’s northbound and southbound superstructure replacements over separate weekends, including full closure of Highway 400 to traffic travelling in the direction of the portion of the bridge being replaced. In addition, the planned works will require the closure of on-ramps to Highway 400 and nearby Finch Avenue West during each of the two weekend operations. The Group ‘B’ EA study of Highway 400 Bridge Rehabilitation is subject to Ontario’s Environmental Assessment Act and will be carried out in accordance with the requirements of the Class EA for Provincial Transportation Facilities (2000) (MTO’s Class EA) as a Group ‘B’ project. MTO’s Class EA allows a Group ‘B’ project to be “stepped down” to a Group ‘C’ if there are no significant adverse environmental effects. Based on the findings of the study, MTO will decide if it is appropriate for the project to be “stepped down”. In the event a decision is made to step down the project to a Group ‘C’, a Notice of Project Step Down will be issued for a 30-day comment period and an Environmental Screening Document prepared for internal use. If the Project remains a Group ‘B’ undertaking, a Transportation Environmental Study Report will be prepared and made available for the required 30-day public review period. The Finch West LRT project has cleared the Transit Project Assessment Process and this EA study is solely for plans related to the Highway 400 Bridge at Finch Avenue West. Please join us at one of these upcoming Public Information Centres (PIC) to learn more about the overall project, find out about the construction and traffic management activities to rehabilitate the Highway 400 overpass at Finch Avenue West, view the information materials, speak to a member of our project team, and provide your input. Although comments will be accepted and considered throughout the study, we request to receive comments on the Study of Highway 400 Bridge Rehabilitation information materials by January 12, 2019. Information will be collected in accordance with the Freedom of Information and Protection of Privacy Act (FIPPA). With the exception of personal information, all comments will be part of the public record.